We have now completed almost 1,500nm on Starry Horizons and are happy to report that all the issues we’ve been having are relatively minor. So for those of you hoping for stories about having to climb the mast in 30 knots of wind to retrieve a halyard, we can’t share those with you (yet, we still have a lot of cruising to do on this boat). I think we both agree that this passage went quite well and having a bit longer on the boat allowed us to get into a good routine. We started out by doing 3 hour watches and then once we got our sea legs, we went to 6 hour night watches so that we could get a bit more uninterrupted sleep. I think that made a big difference as we both had more energy during the day and were able to spend less time napping during the day as well. A couple of the big highlights of the trip were visits from “Not Moby” (the whale) and “Hoppy” (our aviary friend). Not Moby was just ambling along and not concerned with us in the slightest. He stayed close for a little while and then decided we weren’t all that interesting and went off on his own way. But before he left, he at least gifted us with some decent photo opportunities so we could prove his existence. 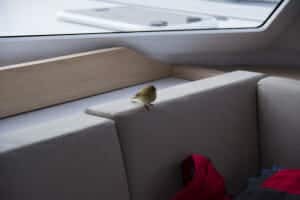 We met Hoppy several hundred miles offshore of the Canary Islands and were pretty surprised that a bird that small was that far out in the ocean. He was a friendly little fellow and even flew inside the salon and down into one of the guest cabins. Though I can’t say I blame him for wanting to find a good place to nap after flying for so long! 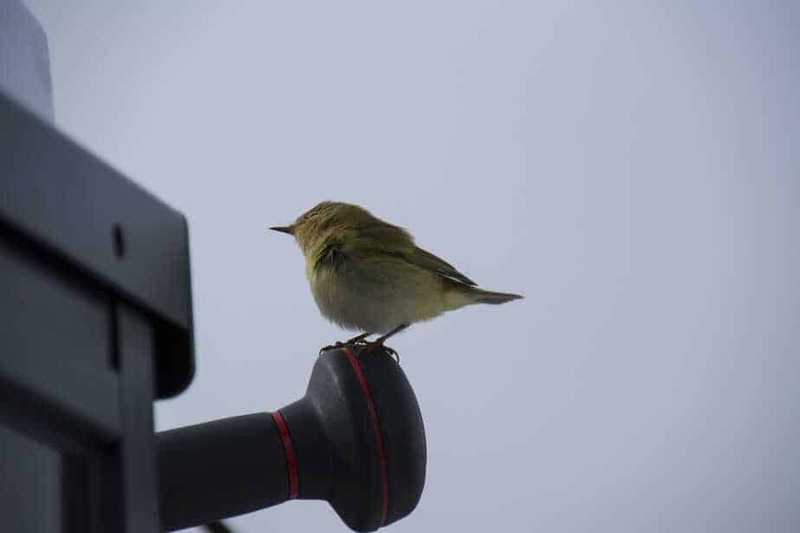 He helped us out by eating a random fly onboard and then he flew off to continue his adventure. In terms of other traffic, we saw lots of commercial ships on this passage but had no problem passing them with lots of room, thanks to AIS. I know I’ve said it before, but that system is proving to be absolutely crucial for these sort of passages. 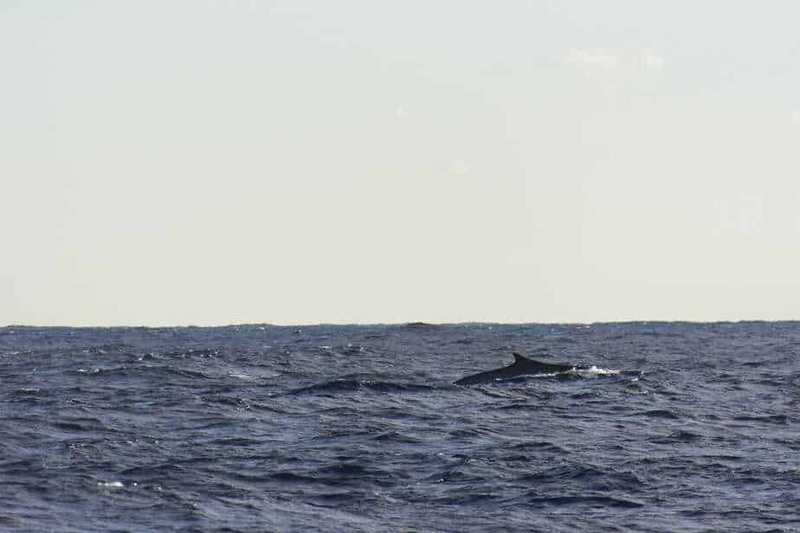 We did have a surprise on day 5 when we saw another set of sails on the horizon. 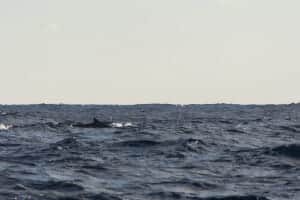 We could tell that it was a monohull, but he was too far away, and the waves too high to really get a good look at him. I’ve been quite surprised at the utter lack of sailboats that we’ve encountered while we’ve been on passage. 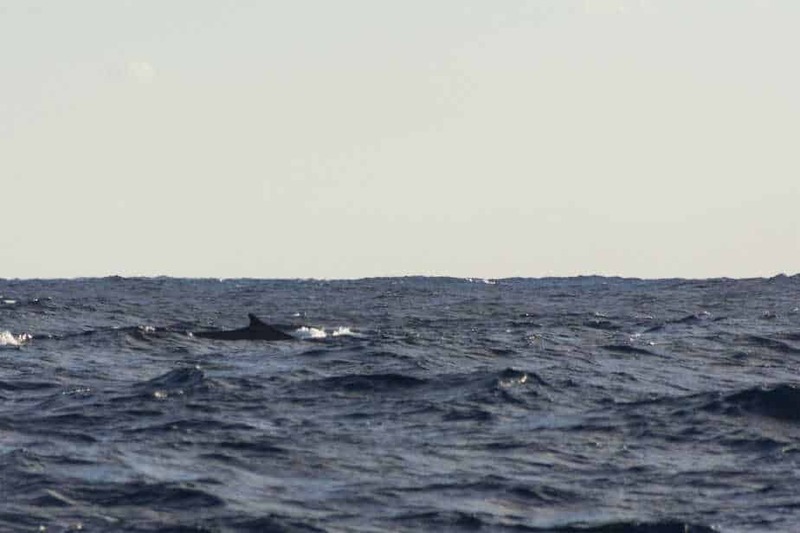 We’re a little behind the large rush of boats heading to the Caribbean (most of which leave the Canaries by the end of November), but I would have thought we’d have been meeting up with some stragglers at least. The arrival into Las Palmas was fairly easy (amazing how much of a difference daylight can make!). Outside the entrance to the harbor there are lots of large commercial ships moored waiting for a berth inside so we gave them lots of space. The marina is just inside the harbor so once we got inside we hailed them on VHF Channel 11 and were told to come to the visitors pontoon. Amy got out all the fenders and we came inside, only to find that there was no room at the visitors pontoon. Fortunately, someone came out on a tender and guided us to a spot. This marked the first time we were going to dock “Med-Moor” style, where you back in towards the dock, attach stern lines, and then we pulled up the mooring lines and attached them to our bow cleats. Of course we attempted this maneuver with pretty decent winds and current, but managed not to hit anything, and later someone told us they thought we looked competent while coming in. I hope that’s a compliment! Now for exciting moments… Since we’ve primarily been sailing downwind and in pretty heavy winds, we’ve been mostly using the genoa without the main as the genoa is easier to manage. With the barber hauler deployed, the genoa has been giving us pretty decent speeds, even if it is not quite up to the polars for the boat. However, the few times when the wind has dropped a bit or changed direction to more of a reach, we’ve raised the main. The issue has come when we try to get the main down. The mainsail on the Helia has 6 batten cars, 1 for the head of the sail, 1 for the diagonal batten at the square-top and 4 for the horizontal battens. With a luff of about 53.5′ (16.3 meters) that means the average distance between the horizontal battens is quite large. When we drop the main to store or reef, the luff of the main between the battens catches the wind and goes flailing about, preventing the sail from dropping. This means that I need to go to the base of the mast to manually haul down the sail. 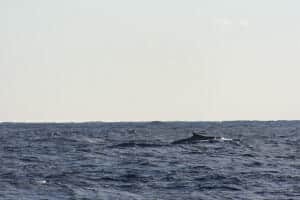 This issue led to our exciting moment when the winds increased from about 12 knots apparent to above 20 knots apparent while sailing downwind and the seas increased from a few meters to perhaps 4. I had originally wanted to reef the main, but when we turned into the wind to lower the sail, we were then pounding into large waves and the luff started billowing from side to side once we dropped the halyard. So instead of trying to reef, I just hauled the sail all the way down and stowed it. It was never an extreme situation, but it wasn’t fun. 1) Trying to flake the halyard on deck and letting it run clean through the stopper. This has worked the best, but the line still gets enough twist that it won’t run free and the sail starts to billow. 2) Dropping the halyard a bit at a time while pulling in our 3rd reef to try and keep tension in the sail, but since the 3rd reef line only runs to the leech, it doesn’t help along the luff. So anyone with thoughts on how we can better manage the mainsail, please chime in. As of now, this is definitely something I would like to take a closer look at when we get to Florida. Very big congrats on your long passage. Sounds like it was quite successful. If I may ask a question: Why have I not heard of any gennaker use? I realize that at about 18-20 knots true you may want to take the gennaker down; however, it sounds like a large part of your time is spent on a broad reach. Ideal point of sail and we often fly our gennaker without the main up if the apparent is greater than 90. I continue to learn from everything you post. Thank you! Rest and have fun. Thanks Frank! Unfortunately, the luff on our screecher (gennaker) is too long so we can not pull it tight enough to ensure a good furl in anything other than really light winds. We’re not willing to risk a situation where winds increase and we can’t get the sail down so we’re not using it. Once we get to Florida, our sail loft is going to re-cut the sail for us, but for now we just have to do without. Fortunately, the barber hauler seemed to work pretty well and as we continue to gain more comfort with the main, we should still be able to sail relatively well.